We all know that television reviews necessarily discuss the events and outcome of a given episode. I rarely warn readers not to read a review before viewing the episode. But “Cryogenics, Lightning, Last Review” warrants an exception. If you’ve been following along with the masterpiece that is Review, don’t shortchange the series or yourself by reading about the finale before you see it. Don’t make me into your Forrest MacNeil, experiencing something in your stead before you have a chance to see and think and feel for yourself. I haven’t talked much about the irony in reviewing Review, about the way it both celebrates and skewers the idea of one person communicating the essence of an experience to a vast audience, whether that experience is dining in a restaurant, reading a book, listening to a song, or being alone in a rowboat. Or, of course, watching a TV show. Each of us is different, with different tastes and desires and scopes of knowledge. Each of us will experience food or art or life differently. That’s the simple idea at the core of Review. The role of a critic is to find the universal experience in the thing critiqued and, sometimes, to explore its personal resonances. But it’s crucial for any critic to stay alert to the buried biases that prevent them from seeing the thing—the meal, the book, the film, or the eating of an ice cream cone—for itself. Each of us will bring our own blind spots to any experience, just as Forrest does. Well, not just as Forrest does. His blind spots are enormous. His blind spots become his métier and his medium. Is Review one of my blind spots? I don’t think so. But like Forrest, I’ll never know. The show has earned my confidence over three seasons of uncompromising excellence. I expected nothing less than uncompromising excellence from the series finale, and when it delivered just that, I was as heartbroken and as impressed as I’ve ever been by a television show. “Perhaps it was just a matter of time before Review stopped my heart, possibly forever,” Forrest MacNeil narrates as he contemplates his first review of the final Review, and as the episode—and the series—concluded, I felt the same. This heart-stopping finale (credited to Andy Daly) grants Forrest rebirth, the revelation that should accompany it, and a chance at reconciliation with his wife. It offers him a chance to reclaim his life and his humanity. It offers him redemption. Then, merciless to the end, Review snatches it all away. Researching cryogenics, Forrest thinks he knows the “alarming enormity” of the assignment. But only after awakening in what he believes to be the distant future does he feel the gravity of his (apparent) choice: to be frozen for centuries, leaving his wife and child behind forever. Believing he’s thrown away any hope of life with his family by journeying thousands of years into the future, Forrest finally sees the truth of the words that open every episode. “Life: It’s literally all we have. But is it any good?” Whatever misunderstanding led Lucille to reserve a session of whole-body cryotherapy (a therapeutic and cosmetic procedure of a few minutes’ duration, which explains the attendant’s chipper, casual air) rather than centuries-long cryogenic preservation, Forrest’s giddy relief shakes his certainty in Review’s mission. Running to Suzanne, he tells her that she’s right, that “there is nothing that I could possibly have shared with the world about being frozen” that would have been worth the sacrifice of losing her and Eric. “Cryogenics, Lightning, Last Review” shows a man teetering on the edge of revelation and falling on the wrong side of it time after time. Fresh from his cryogenics exercise, Forrest hesitates to review being struck by lightning… until A.J. suggests a veto, when he digs in his heels. Falling into his long-established pattern of denial and wish fulfillment (and no doubt still smarting from A.J. taking over hosting duties last week), Forrest convinces himself it was the review of cryogenics, not his failure to perform it and the lesson he learned from it, that led to that moment of near-reconciliation with Suzanne. Desperate, but sensing Forrest is close to coming to his senses, Suzanne plays her last card. Just as he offhandedly suggested, she submits a request through the proper channels: “What’s it like to spend the rest of your life not reviewing anything?” With one question, Suzanne cuts through the bonds of Forrest’s obsession, offering him a way to live instead of reviewing life until it kills him. “That’s love,” A.J. says, obviously touched, and Forrest agrees. Even as he announces the end of his life’s work, he can’t stop laughing in delight, in gratitude, in relief. There’s a terrible irony here. After refusing to engage with Review, Suzanne is finally playing the game in an attempt to end it. But Grant plays better. He maneuvers Forrest into vetoing Suzanne’s request with effortless skill. Grant knows he’s playing on his colleague’s greatest blind spot. Grant knows it means the end of any hope at reconciliation. Grant knows Forrest will keep reviewing harrowing life experiences until one kills him. Seeing a man teetering on the edge of salvation, Grant expertly upsets his balance, sending him to his doom. If you ever doubt the importance of direction, cinematography, and framing to the tone of a narrative, just remember these two shots, seconds apart. A tiny tweak of perspective separates freedom from damnation, separates life from this simulacrum of life Forrest inhabits, separates NEVER REVIEWING ANYTHING EVER AGAIN from REVIEW ANYTHING. Review hasn’t been a ratings-grabber for Comedy Central, but it’s won great acclaim, appearing on many critics’ best-of lists since its first season. It’s the best vehicle yet for Andy Daly, that master of cloaking anguish, corruption, and madness in affability. Jeffrey Blitz (of Spellbound fame) gives the direction an uncanny documentary realism that belies its absurdity. The unforgiving rhythm of Review, of Forrest’s rise and fall, hope and despair, lends it a depth that surpasses any comedy and most dramas. “Cryogenics, Lightning, Last Review” honors that depth and the darkness it draws from. 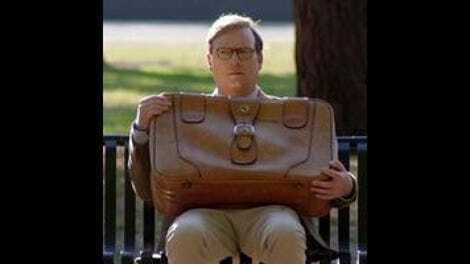 This finale shows how easy, how facile, it would have been to give Forrest MacNeil’s story a happy ending. It’s right there, tantalizingly close. Everyone else gets one, more or less. Suzanne and Eric disappear, presumably to flourish, safe from Forrest’s self-inflicted calamities. A.J. has already landed a travel show, and she’s taking Josh and Tina with her, paying them to travel the world. Grant is bumped up to network vice president. Even Lucille reveals, in an uncharacteristic moment of warmth, that while underemployed at Review, she’s developed a career writing erotica under the name Beverly LaFontaine. Everyone also gets a chance to lapse into unexpected sentiment. Jessica St. Clair’s harried resignation has grounded Forrest’s preposterous misdeeds for years, and she plays this appeal with a ragged calm that’s more distressing than any of the panic she’s shown over the series. Grant’s “You can go back to your family” is almost certainly a ploy to unbalance Forrest before Grant assails his uncertainty, but it sounds so warm that I believed him for a split second. Josh painfully climbs to his feet and clings to Forrest, sobbing, “I love you more than my dad!” Surprised into a just-as-surprising farewell, Lucille gently tells Forrest, “I’m not a very sentimental person, but I’m glad you got out of this dumb show alive.” And A.J.’s escalating reluctance, capped by her resolute refusal to push the button, is very nearly a showstopper. It’s hellishly apt that Forrest ends the show alone on that soundstage, eagerly diving into a future that doesn’t exist. (The single false note in this painfully honest episode: Who’s filming him? But quibbling over that feels a little like Forrest criticizing the “prank.” Let’s not start.) Forrest’s future never existed once he gave himself over to Review. Throughout Review, Forrest is obsessed with not just his duty but also his legacy—with the legend he imagines his “great work” will make him. At the end, that’s what he clings to. We leave Forrest just before he comes face to face with the truth hidden in his biggest blind spot, the belief that some universal force is guiding and protecting him—just before he learns that after he’s abandoned everything for Review, Review has abandoned him. Redemption, rebirth, life—they’re all right there, if only Forrest will reach out and take them. But he can’t, or won’t, and in the end, that’s the same thing. He’s a man who gives up his life chasing a legacy he’ll never catch. It’s a comedy with a tragedy at its heart, or a tragedy costumed in brutal comic beats. Either way, Review is difficult to watch, impossible to look away from, and both dire and delightful to see. Forrest’s ratings: cryogenics, two stars; being struck by lightning, two and a half stars; never reviewing anything ever again, veto; being pranked, five stars. 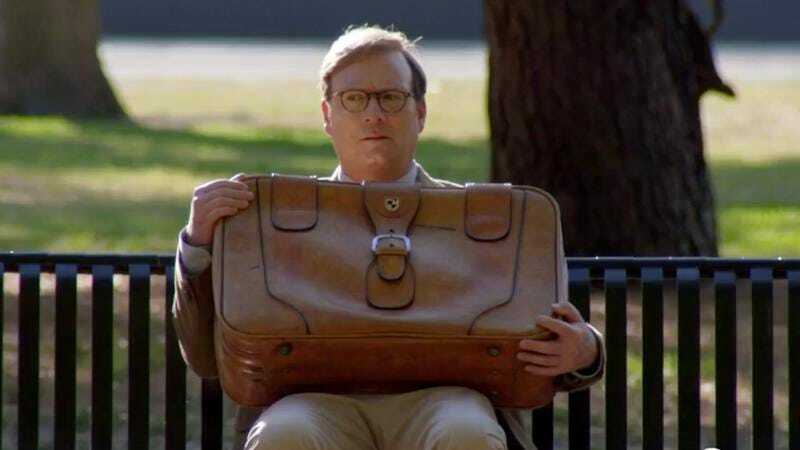 Forrest sitting on the park bench with his suitcase has to be a nod to Forrest Gump at the bus stop, especially with him springing up to run, Forrest, run. That’s Phil Lloyd, co-creator and host of the original Review, as Phil from Melbourne. Emily’s rating: reviewing Review, five stars. Thanks for reading.